Wymondham Methodist Church is located in the Town Green end of this old market town. We warmly welcome people of all ages. Our worship style varies from formal to informal and includes praise and contemplative services. Worship is led by the church’s minister and a team of lay preachers and ministers from the circuit. The Sacrament of the Lord’s Supper is celebrated once a month. 10.30 am Morning Service with Holy Communion once a month. 6.30 pm Reflective Worship on every third Sunday in the Frank Bunn Hall. 7.30 pm on the first and third Monday: Meditation Group - Half an hour of Christian meditation. 7.30 pm on the second Monday only: In-Betweens: a group for ladies of all ages with a varied programme of talks and activities which meets in the Margaret Reeve room of the Town Green Centre. 10.00 am on the second and fourth Tuesday of the month: Men's Group: an informal group, sometimes with a speaker, meeting in the Margaret Reeve Room, for discussing a wide variety of topics. 10.30 am to 12 noon on the first, third, and fifth Tuesday of the month: Colour In Company: an informal meeting with colouring,puzzles and jigsaws and an opportunity to chat that meets in the Margaret Reeve Room of the Town Green Centre. 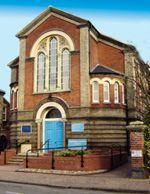 2.00 pm: Women's Fellowship: Meeting in the Russell Bertram Room of the Town Green Centre, meetings start with a time of devotion with hymns, prayers and Bible readings followed by an invited speaker. 10.00am to 11.30am: Parent and Toddler Group meets in school term-time only in the Town Green Centre. 1.30 pm on the first and last Thursday of the month: Two Left Feet: A Beginners sequence dance workshop meeting in the Frank Bunn Room which is open to all. 9.30 am to 11.30 am on the first Friday of the month: Coffee Morning raising money for various charities. 2.00 pm on the Friday following the first and last Thursday of the month: Two Left Feet: A more advanced sequence dance workshop meeting in the Frank Bunn Room which is open to all.